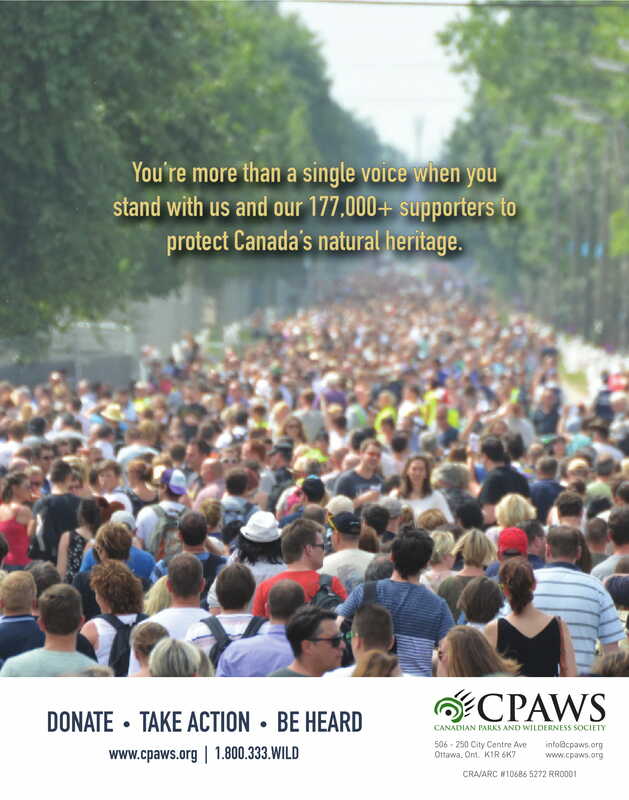 CPAWS is Canada’s only nationwide charity dedicated solely to the protection of our public land and water, and ensuring our parks are managed to protect the nature within them. We work collaboratively with all levels of governments, Indigenous peoples, industry and other environmental groups to develop innovative, science-based conservation solutions. We work alongside communities to engage Canadians in speaking up for nature conservation through outreach, advocacy and education. We are working closely with all levels of governments and partners to almost double the protection of our public lands and waters by 2020 to help preserve the world’s biological diversity for generations to come. With your help, we are able to be the voice for wilderness when decisions are being made regarding the use and management of our public lands and waters. Help us protect the places and animals you love. We are poised to nearly double Canada's protected areas in the next two years. Our biggest priority is to leverage this once-in-a-lifetime conservation opportunity by building our chapters' capacity to do work on the ground in the regions and implementing a nationwide communications strategy to engage and inspire Canadians. Help make a difference in your community by connecting with your local CPAWS chapter. With 13 regional offices across Canada and a national office in Ottawa, we are working nationwide to protect more of our iconic land and seascapes. There are 521 plant and animal species in Canada that are at risk of extinction – some are in danger of disappearing altogether. Do your part to help save our iconic species by donating to our 48-hour fundraiser for species at risk. Giving Tuesday is a day dedicated to giving back. There’s no better way to give back to your community than to help protect Canada’s iconic landscapes and wildlife for our collective health and enjoyment, and for generations to come.